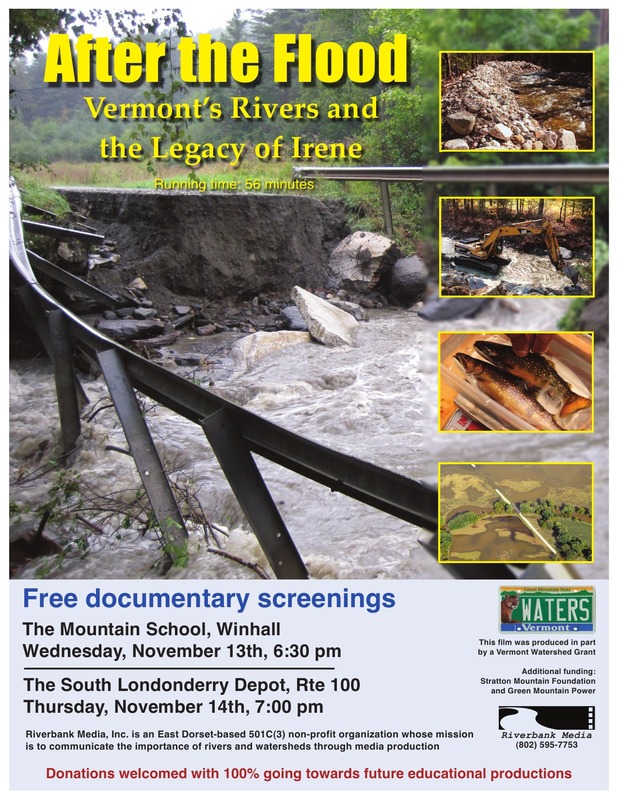 Local non-profit Riverbank Media is pleased to announce a free public screening of its latest film, After the Floods: Vermont’s Rivers and the Legacy of Irene, on Thursday, November 14th, at 6:30pm at the Londonderry Depot at 34 W River St., Londonderry, VT. The hour-long film explores river dynamics, opportunities for improving flood resiliency, and the long-term consequences of river modification on town communities and fish habitat. Producer Joe DeFelice traveled to locations across the state interviewing agency experts and environmental leaders about the current state of our rivers and the challenge of preparing for likely future events. After the Floods was funded in part by a Vermont Fish and Wildlife Watershed grant and is Riverbank Media’s fifth film. For a small donation, DVDs of Riverbank Media’s other work will be available. This entry was posted in Nature, west river trail and tagged after the flood, film, floods, hurricane Irene, nature, river, rivers, southern vermont, vermont, west river trail. Bookmark the permalink.